I know you have been waiting for this recipe for a while now. 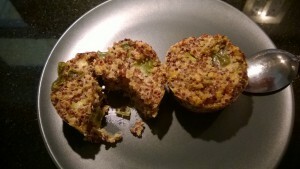 So, here it is: Savory Quinoa Muffins. This is a very easy recipe and you can pretty much add any kind of vegetables you have at home. 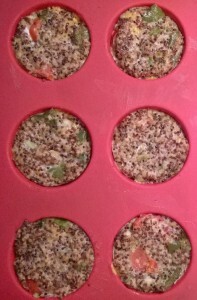 I had a bag of left over vegetables, so I just used those to put in the muffins. One important thing I like to mention, wash your quinoa before cooking. All the quinoa I have is not pre-washed. If you don’t wash it, quinoa will taste bitter. Now, I know that washing those tiny kernels is not en easy feat, but I rigged myself a handy colander – I used a plastic container with lid and pocked several tiny holes in the lid. Put your quinoa in with some water and swish it around a few times, then turn over and squeeze out the water. I normally do this 3 to 4 times and then I am ready to cook. Besides writing the recipe on this blog page I will also add a printable page to my recipe pages of these savory quinoa muffins, just click here. I also made this recipe again by adding 3 pouches of tuna to the mixture and 3 eggs in total. It was delicious and it shows that you can add anything you want to those muffins. I will try again by adding shrimp or sausage, as well as different vegetables – like celery and carrots. 1. Wash and cook your quinoa with 2 cups of water, salt and peppers for 20 minutes, just like you would rice. 2. In the meantime mix tomatoes, onions and cheese in a bowl. 3. Drain the cooked quinoa very well and add to the tomato, onion and chees mixture. Let cool a little bit, so the eggs won’t curdle when you add them. One by one put the eggs and combine with the mixture. Add pepper and chili to taste. 5. 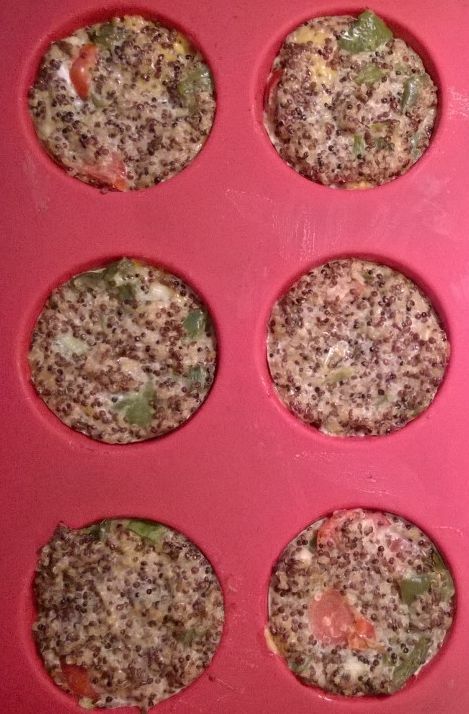 Spoon mixture into muffin cups. 6. Bake at 350F for about 25 to 30 minutes. Check after 25 minutes. They should be bouncy to the touch and not wet. If they are already quite brown on the top and still not done, cover them with aluminum foil and put them back in for another 10 minutes. 7. Once done, let them cool for 5-10 minutes, so the egg can set and you are able to get them out of the form in one piece. This recipe can get you anywhere from 12 to 18 muffins, depending on the size of your muffin forms. Now a warning about muffin forms. I tried both, my silicone forms and the non-stick metal muffin forms. Silicone worked as well as always. I got my muffins out without any breaking.